Ruslan Zeytullaev is a defendant within the so-called case of Crimean Muslims of ‘Hizb-ut Tahrir’. He was detained in the occupied Crimea in January 2015 together with three other Crimean Tatars – Ferat Sayfullaev, Nuri Primov, and Rustem Vaitov. Ruslan was accused of organizing a terrorist organization (p.1, Art.205.5 of the Criminal Code of the Russian Federation). In violation of international humanitarian law, Russia forcibly transferred the four from the Crimea to Rostov-on-Don, where they were convicted by the North Caucasus district military court last year to 5 and 7 years in prison. To date, at least 19 Crimean Muslims are persecuted by the Russian Federation for political reasons within so-called ‘Hizb-ut Tahrir’ case. After the Russian occupation of Crimea in 2014, the criminal prosecution of persons who neither engaged in nor plan to carry out any acts of violence on terrorism charges is used as an additional instrument of pressure on the indigenous population of Crimea, who are deprived of the right to freedom of religion. Russia’s Memorial Human Rights Center recognized Ruslan Zeytullaev along with the other defendants of the case as political prisoners, as did Ukraine’s MFA. Ruslan was also mentioned among other illegally detained persons in the European Parliament resolution “Ukrainian political prisoners in Russia and situation in Crimea” 2017/2596 (RSP), adopted on 16 March 2017. 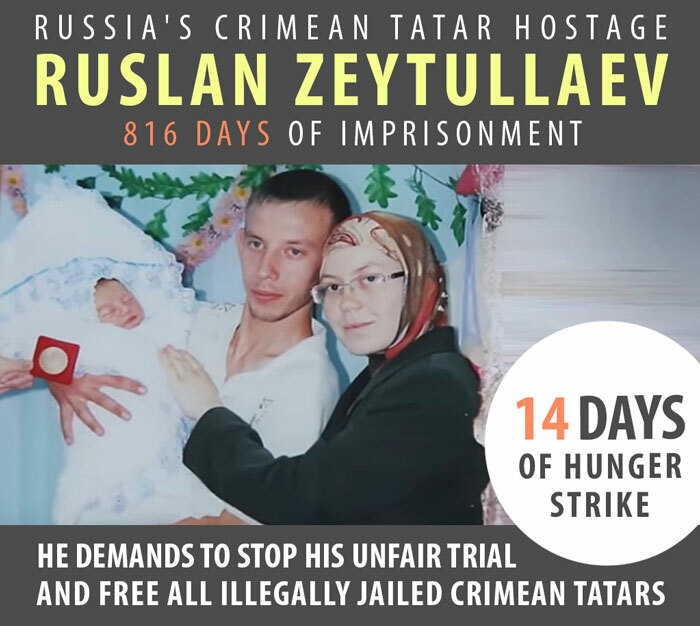 On 4 April 2017, at one of the court hearings Ruslan declared a hunger strike. He put forward three demands: 1) Crimea’s occupation authorities stop the persecution of Crimean Tatars, 2) Ukrainian consuls be allowed access to him, 3) he and other Crimean Muslims illegally held by Russia be transferred to Ukraine.